Happy Sunday! 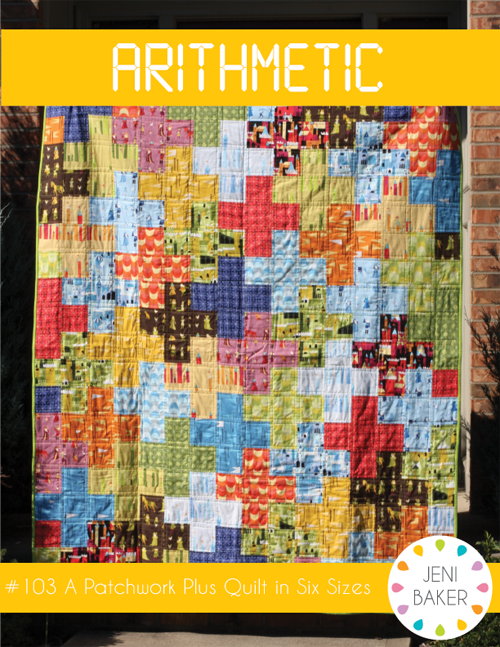 I'm excited to share a new quilt pattern with you today! I've taken one of my most popular tutorials, the Plus Quilt Tutorial (which is still available of course! ), and given it a major upgrade with this pattern, Arithmetic! I've been asked many times for help making other sizes, and especially if I'd provide it in PDF form. This pattern is so much more than that! Folksy Flannels Plus Quilt, a photo by Jeni Baker on Flickr. The original tutorial uses 4.5" squares to make a throw sized quilt. In the pattern version, you'll find instructions/measurements/fabric requirements for quilts using 2.5" squares (for scrap lovers! ), 4.5" squares and 8" squares. On top of that, you can choose from six quilt sizes: Baby, Throw, Twin, Double, Queen, and King! So, you've got 18 different options for your plus quilt adventures! I've included "plus totals" for all the sizes as well to make it easy to cut from scraps, or if you have different yardage than suggested! Giant Neutral Plus Quilt, a photo by Jeni Baker on Flickr. Castle Peeps Plus Quilt - Front, a photo by Jeni Baker on Flickr. New Plus Quilt, a photo by Jeni Baker on Flickr. I have fabrics pulled for a baby sized quilt using 2.5" squares! The all solids plus quilt I've made was given to my parents, and I want one for myself to hang on the wall. I'm using Art Gallery Pure Elements in Mauvelous, Verve Violet, Crystal Pink, Quartz Pink, Lemonade, Dark Citron, Mirage Blue and Tile Blue. Hoping to start cutting today! You can find Arithmetic in my pattern shop, here! Just bought it, excited to make one soon! Thanks!! Love it! I just made the original pattern with 4.5" squares. It is at the long-arm quilter...I can't wait it back and see how it turned out. Thank you!!!! Totally unrelated, but I bought your drawstring bag pattern this weekend and have been having so much fun with the different sizes! The tiny one is my favorite. Perfect for holding jewelry when I travel. Great pattern, very clear and I love the customizable math pages you included. Thanks. Saturday (late!) I finished a quilt top using your tutorial. I made 4" squares out of a Christmas line. I had already made one using larger squares (Joy fabric) and it's amazing how different the quilt looks using smaller squares. Thanks so much for the tutorial! Jen, I didnt know you wrote patterns, I started about a month ago seriously following you, I just thought you were a cute young lady that used vintage sheets and had awesome ability to Super Sew.... This is an awesome aha ha ! moment on a Monday morning. I bought one too! Love, love, love this pattern. Thank you! After I found this pattern, I got so excited! I had received a lot of free fabric generously donated to me to start quilting with and I couldn't figure out what kind of pattern to do - none seemed to fit - until this one. This tutorial is great and very helpful. I am nervous but excited to start sewing. The ironing and cutting has kept me busy but I hope to start sewing this coming weekend! Thank you again for posting such lovely quilt patterns and clearly stating that people have the option to use them to sell quilts on small scale levels. I always am curious about the things I find if someone can use what they create from a pattern. Thanks for a great blog!! I just finished piecing together the 8" blocks for your quilt using a lot of Parisian fabrics. Will call it Pray for Paris, just a reminder to us not to forget them. Plan to do another one for our own country as well. Love this pattern so much!!! Thank you for a quick way to put together a really pretty quilt. Mary Kauffman (Dennis's mom) I would have posted a picture of it but couldn't figure out how to do that. Oh well. By the way, I used the EQ7 quilt program to create the quilt on the PC using the same fabrics that I bought for it and it made it so easy to put together.....did not need to lay it out at all, just printed out the quilt when I had it the way I wanted it then followed the printed picture exactly. So easy! !